4 Reasons to Start Your Home Renovation Project Today! The start of a new year brings renewed energy, motivation and a goal-setting spirit. It’s the perfect time to tackle projects that result in a fresh outlook and new way of living. Channeling your forward-thinking mindset into the planning and design of an overdue home remodeling project can be positively life-altering.Start gathering ideas for your home renovation from Commonwealth Home Design’s portfolio, Houzz, Pinterest or other inspirational galleries found in our blog post: From Home Tours to the Web – Home Remodeling Ideas Are Everywhere. A well-executed renovation project by a professional design/build team requires 4-8 weeks of planning and 2-3 months of build for many types of projects. Beginning your home remodel today will allow you to take advantage of revitalized spaces by summer; just in time for seasonal parties and warm weather entertaining! The kids are back in school, major holidays are over—you’re likely less distracted now than any other time of year! Invest your time wisely and focus on all the ways you can improve your home and quality of life. Start jotting down the areas you’d like to expand, the additional spaces you need, the new fixtures and finishes that will breathe life into your dilapidated kitchen and master bath. A clear mind lends itself to careful planning and timely design reviews. 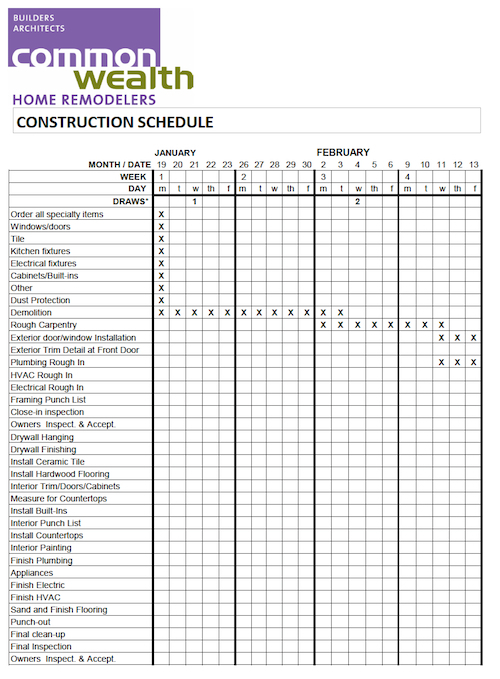 Get ahead of the masses and make sure your project is top priority by locking into contractor schedules now. By the time spring hits, these resources are entirely tapped. Everyone is competing for contractor time and attention in warm-weather seasons. Beat the crowds and lock in today so you can LIVE THE DIFFERENCE by Summer 2015!